1. My favorite school is _____. The University of Illinois, the ultimate drinking school with a football problem. 2. My favorite school is in the _______ Division. The Leaders Division… I think. Let me Google this. 3. As the conference expands beyond 12 teams, should the new teams be added to an existing division or should new divisions be drawn from scratch? These need to be blown up like the 2 versions of the Death Star. Please see the answer to Question #3. 5. Should the B1G change or keep the current division names? 6. If you think the division names should be changed, what should they be changed to? Assuming that logic prevails and the Big Ten has something close to a geographical alignment (a very large assumption when dealing with university presidents and athletic directors that have managed to turn what ought to be a simple exercise into a massive internal political debate), it should be East-West or North-South. If an obsessive Big Ten sports fan like me still needs to stop and think about which school is in which division after two years, then the conference made a mistake. The theme, as I argued over and over again back when the Big Ten added Nebraska, should be K.I.S.S. : Keep It Simple Stupid. The #1 consideration by far should be to protect traditional rivalries, as those are at the heart of what makes college sports great. Close behind that should be geography, as that is a factor that will never change, whether it’s one year from now or two decades down the road. Competitive balance is honestly a minor factor for me. All programs inevitable go up and down on-the-field over time, so attempting to gerrymander divisions based on historical records virtually always ends up backfiring (see the Leaders Division this past season and numerous occasions with the ACC divisions). The Big Ten made a massive mistake in overweighting what it believed to be competitive balance in constructing the current divisions and I hope that they see the light this time around. It’s important, but there can be exceptions provided that those rivals are still playing each other annually. As with the answer to Question #8, it’s important, yet workarounds can be accommodated as long as the rivals continue to play each other on an annual basis. The main problem with the way that the Big Ten constructed the Leaders and Legends Divisions is that most of the Big Ten schools have multiple traditional rivals, which means that many of them inherently need to be in the same division in order for the maintenance of those rivalries to work. Wisconsin is getting completely screwed by not getting to play traditional rival Iowa and the Badgers are a natural school to help further integrate Nebraska into the conference. In my opinion, the Wisconsin/Iowa/Minnesota trifecta should have never been split up and Nebraska fits in there as the fourth wheel of that western flank perfectly. 10. Currently, the number of conference games the B1G plays is 8. Should this increase? Yes, the number of conference games absolutely needs to increase to 9. This is even more important if the Big Ten continues to designate cross-division annual rivalries, where schools would only play their counterparts in the opposite division (excluding designated cross-division rivals) only 2 times in a 12 year period without a 9th conference game. That extra conference game at least turns it into a more tolerable 2 times in a 6 year period cycle (which still isn’t exactly optimal). While every school in the conference wants to maximize home game revenue by playing more MACrifice games, the Big Ten isn’t like the SEC, which has a history of having conference members going very long periods of time without playing each other and doesn’t think much of it. That won’t (or at least shouldn’t) fly in the Big Ten. The fact that the Big Ten had agreed to go to 9 conference games in a 12 school alignment prior to the now-defunct Big Ten/Pac-12 alliance gives me optimism that they’ll do so when it’s even more critical. I’m a very large believer that every conference should have all teams qualify for its basketball tournament. Unlike the football conference championship game that only involves 2 teams, the basketball tournament is the one major conference event where the teams, fans and alums from all of the schools can gather together as a shared experience. For those that say that the conference tournament should be about merit, I would reply that leagues should eliminate conferences tournaments all together if people want to be truly merit-based (as the performance over the course of 3 months of regular season games should trump what occurs in 3 days of a conference tournament). Basketball tournaments are purely money-making machines for the power conferences, so you might as well let everyone participate. Plus, there’s the romantic idea that every single school still has one last shot to make it into the NCAA Tournament, which is inherently a more interesting aspect of watching conference tournaments compared to how they’re really just seeding exercises for the teams that already know that they’re going to make it to the Dance. 12. Currently, the B1G has no divisions for basketball. Should this be changed? I don’t believe that basketball divisions are necessary as long as each school has at least 2 or 3 locked-in annual rivals (e.g. Indiana-Purdue, Michigan-Ohio State, etc.). 13. If yes, why should there be divisions for basketball? Please see answer to Question #12. 14. If no, why shouldn’t there be divisions for basketball? 15. When people reference “B1G”, do you recognize that to be the Big Ten Conference? Yes, I do. At first, I wasn’t a large fan of the new Big Ten logo, but that has grown on me (unlike the division names). In the social media context, being able to refer to #B1G on Twitter and have people generally know what that means is extremely useful. That’s not a minor point in today’s world. 16. With 14 teams currently, should the B1G remain the “Big Ten”, or should its name be changed? It should ALWAYS ALWAYS ALWAYS be the Big Ten, even if it ends up with 16 schools or more. If the Big Ten didn’t change its name back when it added Penn State over two decades ago, it certainly shouldn’t do it now. There’s way too much name recognition and brand value with the conference name. 17. Do you have any further thoughts on B1G expansion? 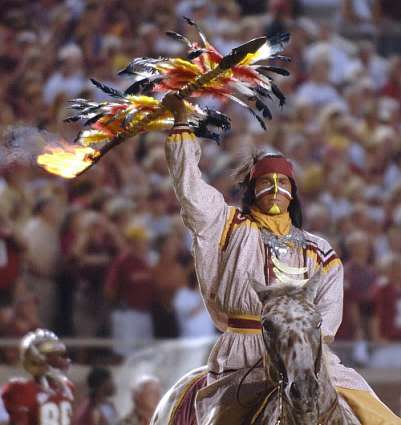 Well, I’ve provided my thoughts on Florida State here. Otherwise, I don’t have a preternatural desire to see the Big Ten expand further. The 14 schools that the conference will have going forward fit together well academically and institutionally with geographic continuity across the Northern half of the United States. If there’s a legit football power in a top market such as Florida State available, then I think the Big Ten ought to be aggressive. However, there isn’t an overall need for the conference to expand for the sake of expanding. I’d be perfectly happy with staying at 14 members. (a) Ohio State and Michigan must play annually – This is pretty obvious. (b) Ohio State and Penn State must play annually – This might be less obvious to people outside the Big Ten (or even with some fans within the Big Ten), but trust me, this is a non-negotiable game. (c) Penn State, Rutgers and Maryland must be in the same division – The entire crux of the Big Ten expansion to 14 is to solidify the league’s presence on the East Coast, which effectively mandates that they have to be together. What’s evident here is that Ohio State and Penn State are really the keys to the new Big Ten divisional alignment. For instance, these parameters mean that there is no way that Ohio State can be in a division opposite of both Michigan and Penn State – the Buckeyes have to be in a division with at least one of those schools. The East Coast bloc of Penn State/Rutgers/Maryland also limits the league’s options. We also have to consider whether the divisions need to split up the four traditional powers (Michigan, Ohio State, Penn State and Nebraska) evenly or if 3 of them can be in one division. I personally believe that 3 of them can be in one division provided that the other side has more depth of non-bottom feeders top-to-bottom, but know that others (particularly athletic directors) may disagree with that. Even though three “King” programs are in the East, I believe that there is still a solid balance of schools with top notch fan bases in the West (Nebraska, Wisconsin, Michigan State, Iowa) to compensate for it. Most other ways of attempting to put two Kings in each division end up with wacky geography or one extremely strong division and the other being very weak. (Yes, I know that I’ve said that I don’t think that competitive balance should matter, but I’m realistic in believing that others believe it’s important.) Now, it’s understandable that the older members of the Big Ten West likely would not be happy only seeing Michigan and Ohio State 2 times every 6 years, so that could be a deal-killer. 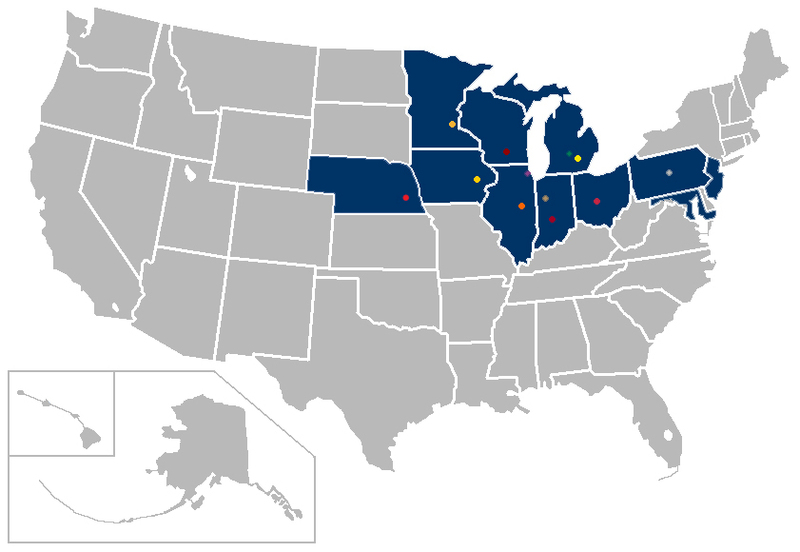 The “Inner-Outer” setup that the BTN provided as a choice here is an interesting concept, as it groups the 4 western schools (Nebraska, Wisconsin, Iowa, Minnesota) with the 3 Eastern schools (Penn State, Rutgers, Maryland) in one division while the 7 other schools in the middle are in the opposite division. It’s terrible in terms of geography and the casual sports fan would look at it and say, “WTF? !”, but it does achieve the goal of preserving every single traditional rivalry as an intra-divisional game with the exception of Ohio State-Penn State. I’m not a fan of the Inner-Outer alignment personally (and most people that I know don’t like it either), yet I certainly wouldn’t put it past the Big Ten presidents and ADs to head down this road. The events of the past week really put back into focus what’s most important in life: friends and family. This video always brings back fond memories of my family popping in a VHS tape of the John Denver Christmas Special with The Muppets every year and my own kids now find The Muppets to be just as hilarious as I did. I hope that all of you and your loved ones have a wonderful holiday. When I was attending DePaul for law school a decade ago (it makes me feel ancient to say that) and the Blue Demon athletic program was toiling away in Conference USA, the university looked at joining the Big East as an aspirational goal in the same way that Rutgers looked at the Big Ten or Utah looked at the old Pac-10 for many years. The Big East was the home of the schools that DePaul either saw as urban Catholic school peers (such as Vincentian counterpart St. John’s) or academic leaders (Notre Dame and Georgetown). When Conference Realignment circa 2003 reared its head and opened up spots in the Big East, DePaul couldn’t run to that league fast enough. While the non-Catholic Big East schools at the time such as Syracuse and Pitt were attractive partners in terms of pure athletics, it was the Catholic school base that was DePaul’s draw. The belief was that no matter what happened, DePaul would be linked to those major Catholic schools going forward. Now DePaul is moving forward with Georgetown, Villanova, St. John’s, Seton Hall, Providence and Marquette in breaking off from the Big East and forming a new basketball conference. There are some formalities that need to take place on figuring out the process of how this will actually occur, but it’s conceptually a done deal. I’m not someone that was ever a large believer in the inevitability of a split between the Catholic schools and football members of the Big East. Ever since the initial ACC raid of the Big East in 2003 of Miami, Virginia Tech and Syracuse, the hybrid model of the league was still a net positive for all of its members even if a lot of fans complained about it. The Catholic schools benefited from having a power conference image via the Big East’s AQ status in the BCS system despite not playing FBS football, while the all-sports members got direct basketball access to the major markets of New York, Chicago, Philadelphia and Washington. They were all worth more together than they were worth apart. The equation changed with Notre Dame, Rutgers and Louisville leaving, though. The network effects of those brand names (well, at least with respect to Louisville and Notre Dame for basketball) coupled with the Catholic schools were eradicated. With the value of the Big East’s new potential TV deal plummeting in the marketplace due to defections, the Catholic schools believed that they weren’t receiving a clear financial benefit from the hybrid anymore. Maybe they would still a little bit more by sticking with the Big East, but it wouldn’t be enough to make it worth it to continue to be subject to the whims of football-driven realignment. I’ve said this before and I’ll say it again: stability can trump even money in conference realignment. The Big East Catholic schools finally got tired of getting dragged through the mud on account of a sport that they didn’t even play at the top level. Even an extra $1 million per year in TV money for staying in the hybrid is fairly small in the scheme of things if you have a choice between controlling your own league or other conferences poaching your league controlling you. Ultimately, I believe the new basketball league using the Big East Catholic schools as a basis will be successful within the parameters of what can be reasonably expected out of non-football conference. If the new league moves forward with poaching Butler and Xavier from the Atlantic 10, who have apparently already agreed to join with St. Louis University, Dayton, Creighton and VCU under consideration for the 10th spot or possibly 3 spots to form a 12-team setup), then it’s an attractive proposition to the TV networks. ESPN, for example, can throw $20 million to $30 million per year at this conference (which would be less than what ESPN currently pays the Big East for basketball in a pitiful contract that was signed for a rock bottom amount in the mid-2000s) and that would constitute a pay raise for the Catholics on a per school basis. It’s not exactly a stretch to believe that ESPN would rather do that to get the bulk of the Big Monday games that they would have wanted, anyway, while completing avoiding the need to pay for Big East football games that the network doesn’t have any use for. To be sure, the Catholic schools would not have bolted if the Big East had the composition that it had when this year’s college football season started. A split was always a very last resort and that moment came when Louisville got invited to the ACC. Staying in the hybrid for the sake of continuing to play UConn was no longer enough (even if new incoming members such as Memphis were strong in basketball). The one good thing out of all of this is that the Big East Catholic schools will be going from a league with no institutional identity to a new conference with as strong of an institutional identity as any other out there. Institutional fit is a hallmark of the Big Ten, Pac-12 and other stable conferences and that will serve the new league well. This Big East basketball season is going to take on the air of the last year of the Southwest Conference, where no one knows whether many of schools will ever play each other again. I’ll have more on this as the story continues to develop. The irony of writing a blog that’s largely known for being focused upon conference realignment and Big Ten expansion is that I’m personally not someone that has a preternatural need to see the kingdom of Jim Delany get larger and larger. Back when I originally starting writing about the topic three years ago, I only really saw a necessity for the Big Ten to add 1 more school to create a conference championship game and wasn’t a large proponent of expanding to 14, 16 or beyond. All of the superconference ideas with an emphasis on pods and market shares interest me greatly from a business perspective, but the number of potential expansion candidates out there that make me perk up as fan is pretty small. If the Big Ten needed to go up to 16 to get marquee schools such as Texas or Notre Dame, then that would have been one thing, but expanding simply for the sake of market share can backfire in the long run. Nebraska certainly qualified as a school that I’d go out of my way to actually watch play football, so I was content with the thought of the Big Ten staying at 12. I completely understand the latest moves by Big Ten commissioner Jim Delany to add Maryland and Rutgers to move the league up to 14 members as a way to stay ahead of the ever-changing demographics of this country, yet that’s largely the business side of my brain coming to that conclusion. Personally, I’d take a hard look at Florida State because they are so extremely valuable in a key state (especially if the Big Ten is seriously considering Georgia Tech and don’t want them to be a lone outpost), yet the tea leaves are saying otherwise. But it should be getting more and more clear after Maryland’s departure from the ACC, Florida State is not sitting around playing solitaire. According to Warchant.com, the Florida State site on the Yahoo!/Rivals network, FSU officials are now exploring conference options and have put out feelers to the Big Ten. That small line about Florida State putting out feelers to the Big Ten (even though the article overall has a Big 12 slant) has stuck out at me as much as anything that I’ve seen regarding conference realignment over the past three years. As we have seen time and time again with the kabuki dance of switching leagues, the proper order is that a school contacts the conference that it wants to switch to first as opposed to the other way around. To say the least, my line of thinking is really starting to shift here. Remember back in 2010 how Missouri was repeatedly the most oft-mentioned expansion target for the Big Ten, but then the true intentions of the league were to really go after Texas and then Nebraska? Missouri was effectively used as a stalking horse by Jim Delany to cause instability (or create the perception of instability) in the Big 12 to shake loose one of the most valuable brand names in college football. Now look at the most oft-mentioned targets of the Big Ten in this current phase of realignment: Georgia Tech and Virginia. Both are fantastic academic institutions in fast-growing states, but they aren’t exactly power punches on the football front. They’re really extensions of the pure demographics plus academics strategy that drove the Maryland and Rutgers additions. With the Big Ten at 14 members, we’re possibly looking at the last 2 open spots that the league will ever have to get up to 16. Are Georgia Tech and Virginia who the Big Ten wants to grant those last precious spots to? The academic side of the league would obviously love it, yet there’s something missing on the athletic front (which in turn impacts the financial front). What we now have is the perception of instability in the ACC just like there was a perception of instability in the Big 12 in 2010 through 2011. If the Big Ten is seriously considering further raids of the ACC, then why wouldn’t it go after the biggest whale possible? Why wouldn’t it make the move that would both the bean counters and the fans would love? Is getting Florida State the true intended end game for the Big Ten? Outside of geography, the only real reason that has been given by numerous people, including me, as to why the Big Ten would conceivably pass on Florida State is academics (and specifically the lack of membership in the AAU). That assumption might be faulty, though, especially if Florida State were to come in together with an elite academic school such as Georgia Tech or Virginia. Besides, Florida State is ranked #97 in the U.S. News rankings compared to Nebraska at #101, so it’s nowhere near the academic stretch for the Big Ten in the way that Louisville was clearly outside of the ACC’s prior academic standards. Beyond academics, out of all of the schools in the ACC, Florida State provides (1) the best on-the-field football program, (2) the largest state by population, (3) the highest national TV value, (4) the most regional TV value for the Big Ten Network, (5) the best football recruiting grounds and (6) arguably the best football fan base (neck-and-neck with Clemson). Basically, FSU hits every non-academic metric that you could possibly want in an expansion candidate. Tallahassee and the rest of the Florida Panhandle are definitely Southern in culture (which could clash with the Northern Big Ten culture), but much of the rest of the state of Florida where FSU alums and fans reside has one of the largest concentrations (if not the largest concentration) of Big Ten alums outside of the Midwest. It’s not an accident that after the Rose Bowl, the Big Ten has its top bowl tie-ins with the Capital One Bowl (Orlando), Outback Bowl (Tampa) and Gator Bowl (Jacksonville) and just signed up for a partial Orange Bowl (Miami) tie-in once the new playoff system starts. Much like New York City and Washington, DC, there are potential synergies for the Big Ten in the state of Florida that really go beyond the applicable school that’s being added. In the same way that Texas A&M fans started complaining so much about the Big 12 that it eventually pushed the school’s administration to approach the SEC, Florida State fans have been rumbling about moving out of the ACC for months. So, if Florida State is truly an unhappy camper that’s ready to move (and to be clear, it needs to start coming from the university president level instead of the fans or even trustee members on a power trip), it would be foolish for the Big Ten to automatically pass on the Seminoles on the basis of academics. AAU membership is obviously highly desired, but the Big Ten would let in non-AAU school Notre Dame in a heartbeat. The Big Ten also admitted Nebraska even though the existing members knew full well that NU’s AAU status was in jeopardy (as the school was kicked out of the organization only months after joining the conference with both Michigan and Wisconsin voting against them). In other words, the Big Ten has demonstrated a willingness to look past the AAU issue for the right school, and Florida State may indeed be the right school in this situation. Now, as with anything in conference realignment, it takes two to tango. The Big Ten could want Florida State all day long, but it means very little unless the interest is reciprocated. That’s what makes Florida State “putting out feelers to the Big Ten” so intriguing. At the very least, that indicates some interest on the part of FSU. I’m not going to insult the intelligence of Florida State fans and alums that might be reading this, so I’ll be objective here: even though I’m a huge Illinois fan and Big Ten guy, my personal opinion is that the SEC would be the best conference for FSU if it were to move from the ACC (and I’m sure that would be the choice of most Seminoles fans). The SEC fits Florida State geographically and culturally while also providing a juggernaut football league. If FSU has offers on the table from the Big Ten and SEC at the same time, then I’d be hard pressed to advise the school to turn down the SEC when taking my Big Ten goggles off. However, Mr. SEC (probably the closest thing to my SEC counterpart regarding conference realignment) has noted that the SEC is on the precipice of creating a new TV network with ESPN and would prevent any consideration of newly doubling up in existing SEC states for financial reasons. In the case of Florida State, the value of in-state rival Florida is so great that a potential SEC network could easily get basic carriage in the state of Florida based on the strength of the Gators alone, which means that FSU is worth much less to the SEC than it would to the Big Ten or Big 12. (The Big Ten saw this on a smaller scale when looking at Pitt as an expansion candidate. In terms of academics and institutional fit, Pitt was and still is a great match on paper for the Big Ten, but it’s a school that wouldn’t bring in a single cent of additional BTN revenue since Penn State already delivers the entire state of Pennsylvania by itself.) Now, the SEC certainly might see value in adding Florida State simply to prevent the Big Ten or Big 12 from encroaching on the most important TV market and football recruiting territory in its footprint as a defensive measure, but let’s assume for the purposes of this discussion that the SEC isn’t a viable option for FSU. So, if the SEC is out of the picture, why would the Big Ten possibly let the Big 12 walk off with possibly the most valuable school that has been willing to move in conference realignment over the past three years? That would create two power conferences (the SEC and Big 12) that combine the recruiting bases and TV households of both Florida and Texas, which would be dangerous for the Big Ten to allow to occur in the long-term. While I could understand how the SEC would be more attractive to FSU than the Big Ten, I don’t see how Jim Delany would lose in a head-to-head battle with the Big 12 over the school if it came down to that. The only real advantage that the Big 12 provides over the Big Ten is access to the state of Texas. That’s not insignificant, but it’s not outcome determinative in my eyes (as evidenced by Nebraska and Colorado willingly giving up their ties to that state). On the fronts that university presidents care the most about, the Big Ten has all of the trump cards. The Big Ten was projecting over $43 million per year in conference revenue in 2017 when it was talking to Maryland. Now think about what that figure would look like when you add the households in the state of Florida to the Big Ten Network (which has over 5 million more people than the states of Maryland and New Jersey combined with a population base that is a lot more attuned to college sports, to boot). Those are figures that the Big 12 can’t match, even if FSU could procure a lucrative third tier rights deal that the conference allows. The Big Ten also has a clear academic prestige advantage over the Big 12. In terms of geography, the Big Ten is even slightly less inconvenient than the Big 12, where Columbus, Bloomington, West Lafayette and Champaign are actually all slightly shorter distances to Tallahassee than both Morgantown and Austin among the closest existing members of those leagues. I would assume that both the Big Ten and Big 12 would add 1 other Southern ACC member (likely Georgia Tech or maybe Miami for the Big Ten or Clemson for the Big 12) to pair up with FSU, so the Seminoles wouldn’t be a lone geographic outlier in either case. (To be sure, I’m not going to sugarcoat the geography issue for FSU with respect to either the Big Ten or Big 12 – it’s definitely not optimal in either case. That being said, the ACC stuck Florida State in a division with Boston College and Syracuse while not having the Noles play its closest conference counterpart of Georgia Tech annually, so that conference hasn’t exactly mitigated FSU’s travel distances even with a large contingent of Southern schools.) All in all, the Big Ten can offer more money and better academics compared to the Big 12 with similar geographic challenges, so this shouldn’t be a matter of Florida State actually preferring the Big 12 over the Big Ten. I don’t know whether Florida State is truly serious about wanting to leave the ACC. As I’ve said in other posts, I’m not a believer in the impending destruction of that conference like many others that follow conference realignment. There are still a host of academic and geographic advantages that the ACC provides to its member schools and if it was tough for Maryland to leave at an emotional level (where that school was a completely natural and contiguous expansion for the Big Ten and they didn’t have any true blood reciprocal blood rivals), one can imagine the potential disconnect with a school like FSU. However, Florida State fans might be at the point where they have an “Anywhere but the ACC!” attitude, which is a tough train to stop for a school’s administration. As I’ve been thinking more and more about the Seminoles looking around as a free agent (which is how an FSU official described the process in the event that the Maryland exit fee from the ACC gets reduced or thrown out), it’s the first time since I began following conference realignment that I have actually wanted the Big Ten to create a superconference in a scenario that didn’t include the game changing choices of Texas and/or Notre Dame. The Seminoles provide the best combination of an off-the-field financial windfall off-the-field and increased on-the-field competitiveness and fan interest of any school that the Big Ten could plausibly add at this time. As a result, Florida State is a school that would make a 16-team league worth having and I hope that Jim Delany and the Big Ten university presidents are feeling the same way. (1) Is the Big Ten done expanding? – From the standpoint of the Big Ten initiating another expansion, yes, I believe that they’re done for the time being. In my opinion, it would take another move from the SEC and/or Big 12 for the Big Ten to act again since the most likely targets for Jim Delany won’t want to move unless they are absolutely forced to do so. (We’ll get to those schools in just a moment.) Ultimately, the Big Ten’s expansion with Maryland and Rutgers needs to be looked at in conjunction with the decision to add Nebraska in 2010. When Delany first announced that the Big Ten was looking to expand three years ago (and kick-started a conference realignment process that continues to this day), addressing long-term demographic concerns was right alongside improving athletics (AKA improving football) as the top goal. The Big Ten’s home population base of the Midwest has been slowing in growth for many years (although too many people on the coasts tend to overstate this since their image of Rust Belt tends to focus upon Detroit, whereas places such as Chicago, Minneapolis, Indianapolis and Columbus have been growing at a perfectly fine clip), which meant that it was imperative for the conference to address that issue while it was still in a position of strength. For all of the talk about how conference realignment has largely been about TV dollars, the Big Ten’s addition of Nebraska was probably the purest football move that any conference made in this round of realignment with the Cornhuskers bringing along one of the most tradition-rich football programs and a rabid fan base. Nebraska, though, didn’t do anything to address the need to expand the conference’s footprint, hence the latest moves with Rutgers and Maryland. Getting into the New York City/New Jersey and Washington, DC/Baltimore regions addressed the overall demographic concerns for the Big Ten, so there isn’t any urgency to do more. Outside of adding Texas, the conference can’t really add more households with two schools than the #1 (New York) and #4 (DC/Baltimore) combined statistical areas on top of the #3 (Chicago) CSA that it already has. As a result, I don’t see the Big Ten on the proactive prowl unless moves by other conferences (or threatened moves by other conferences) shake some of the schools that I’m about to mention loose. (2) If you’re wrong, Frank, who would the Big Ten go after? – Let’s assume that the SEC and Pac-12 aren’t going to be poached and the Big 12, with each school having assigned its TV rights for the next 13 years to the league (called a “grant of rights”), probably won’t lose anyone else, either*. The amount of a buyout of a grant of rights would likely need to be equal to the present value of the applicable school’s home TV rights for football and basketball games for the rest of the grant of rights period. For example, any conference that wants Texas needs to pay the Big 12 the equivalent of the rights to all Longhorn home games for the next 13 years, which could easily run into the hundreds of millions of dollars considering what ESPN is willing to pay for not-very-desirable third tier games. This is what makes a grant of rights (which the Big Ten and Pac-12 have in addition to the Big 12) such a powerful deterrent to schools leaving. As a result, that basically means that the “realistic” (and I use that term very loosely) targets for the Big Ten would come from the ACC or, much less likely, Big East. Rumors over the weekend indicated that the Big Ten was poised to invite Virginia and Georgia Tech (which have since been dismissed by Georgia Tech’s president). Certainly, those two schools would fit the Big Ten in terms of institutions, but the question is more about whether they would add enough athletic revenue and can integrate into the league culturally. For all of the consternation about the Big Ten supposedly leaving its Midwestern roots by adding Rutgers and Maryland, those were fairly mild changes geographically and culturally in the context of conference realignment over the past three years (both for the Big Ten and the new schools themselves). Those two institutions are in states that are geographically contiguous with the existing Big Ten footprint and there is much more of cultural difference between the the North and South (like oil and water) compared to the East and Midwest (distinct but complementary with each other). I’m fairly certain that Virginia would be in the long-term plans for the Big Ten as an elite academic institution that’s the flagship in what will now be another contiguous state with the addition of Maryland. However, UVA still very much considers itself to be a Southern school (whereas Maryland has really turned into a Northern school for all practical purposes over the past couple of decades) and that’s going to be a cultural barrier for it to joining the Big Ten no matter how much Jim Delany can offer Thomas Jefferson’s creation. While the influx of transplants to Northern Virginia just south of Washington, DC have been “Northernizing” the Commonwealth, that process isn’t anywhere complete yet. Georgia Tech is an interesting case to me. There has been quite a bit of smoke about the Yellow Jackets contemplating Big Ten membership, but this is one move that I have a hard time seeing happening. On paper, Georgia Tech seems to fit what the Big Ten is looking for as a top academic institution in the middle of a fast-growing Atlanta market that also happens to be rich with football recruits. The problem, though, is that even if the Big Ten were to add UVA at the same time, Georgia Tech makes little sense as a lone outpost in the Peach State. Atlanta is SEC territory to the core and the Big Ten attempting to challenge Mike Slive there with only Georgia Tech alone would be a complete lost cause. It would be akin to the SEC taking Northwestern and then trying to claim the Chicago market – it simply wouldn’t work. Rutgers and Maryland can combine with the presence of Penn State, Ohio State and Michigan alums in the NYC and DC regions to create positive network effects that are greater than the fan bases of those two schools. While a large number of Big Ten grads are moving to Atlanta, there are so many more SEC grads and fans (along with fans of other Southern ACC schools such as Clemson and Florida State) that it’s one of the few markets that I believe Jim Delany has no chance of ever breaking through in. To be clear, I really like Georgia Tech as a school, but in terms of Big Ten expansion, I actually believe that its location is going to work against it. North Carolina – UNC is essentially in the same boat as UVA: likely a very top long-term target for the Big Ten, but probably a generation away from becoming “Northernized” enough for the school to consider a move. Plus, UNC effectively has the same status in the ACC as Texas has in the Big 12: the ACC is their conference. As we’ve seen with Texas, having control can often be more of an allure than having money. Therefore, as much as both the Big Ten and SEC would love to add UNC, the Tar Heels aren’t going anywhere until the ACC is completely on its deathbed. UNC certainly wouldn’t start the exodus. Miami – The Hurricanes have long been a sleeper pick for me if the Big Ten were serious about raiding the ACC further. While Miami isn’t an AAU member, it has research levels that would justify its inclusion in the group and would the 4th highest ranked Big Ten school in the US News undergraduate university rankings (behind only Northwestern, Michigan and Wisconsin). The school continues to be a top national TV draw even in its down years and is located in arguably the best pound-for-pound football recruiting territory in the country. Most importantly for me, it’s the only real power conference school that’s located in the Sun Belt but is really a Northern school culturally. Last week, the Chicago Tribune actually posted data of the most popular out-of-state colleges that Illinois residents attend. While bordering flagship schools such as Iowa, Missouri, Indiana and Wisconsin draw tons of students of Illinois, there were only a handful of power conference schools outside of the Midwest and Kentucky (which borders southern Illinois) that were able to draw more than 100 freshmen from Illinois this past year: Colorado, Arizona, Arizona State, Vanderbilt and… Miami. In fact, Miami draws about 5% of its students from Illinois, which is a higher percentage than any out-of-state Big Ten school other than Iowa, Indiana, Wisconsin, Purdue and Michigan. The thing is that Miami draws even more students from the New York/New Jersey corridor that the Big Ten is now trying to lock down. This is only one piece of data, but it’s indicative of the fact that if there’s one school in the South that won’t give a crap about being in a Northern conference, it’s Miami. People can note that they’re about to be sanctioned (my retort is to look at UNC) or they have a fairweather fan base with poor attendance (my response is that we just added Maryland), but they actually have a legit football history and the home recruiting base to maintain it regardless of possible NCAA actions down the road. Much like USC, the location of Miami itself means that they will always be in position to win with the right coach. In my opinion, Miami is a potential candidate that works regarding academics, demographics, TV market, football recruiting and football history. The fact that it’s a private school shouldn’t eliminate them from consideration. Virginia Tech – Another sleeper pick for me for the Big Ten. The assumption of many followers of conference realignment is that the SEC would want Virginia Tech, which is exactly why the Big Ten shouldn’t let Mike Slive walk away with them. With the addition of Maryland, the Big Ten is now committed to owning the DC market. Jim Delany should be able to withstand preexisting ACC ties there, but letting the SEC in with arguably the most popular football school in that area would be particularly damaging. Remember that Virginia Tech doesn’t pose the same academic issues that, say, Texas Tech did when the Big Ten was looking at Texas a couple of years ago. Much like Miami, VT is a school that has AAU-worthy metrics despite not being currently a member and, in the US News undergrad rankings, is tied with Iowa and Michigan State and ahead of Indiana and Nebraska. Similar to Miami, it’s a school that addresses several needs regarding demographics, TV market (locking up DC) and the strength of the actual football program. If the Big Ten wants UVA and they’re say that they’re required to bring VT along with them, it’s a pretty easy decision to say yes if I were running the conference. Duke – Full disclaimer here: I hate Duke. I REALLLLLLY HATE DUKE. Even as a massive Bears fan, Duke ranks ahead of the Packers as the team that I hate the most (whether college or pro) on the basis that a Green Bay win could conceivably help the Bears in a playoff race depending upon the records, whereas there is absolutely nothing positive that could come out of Duke winning a game. The thing is that there are many people that feel the same way even though (like me) they aren’t even a rival of my alma mater (Illinois), which is why they can’t be discounted as a potential Big Ten candidate or thought of as powerless in the football-focused game of conference realignment. The academics at Duke are obviously impeccable and the basketball program draws attention and ire like no one else in college sports outside of Notre Dame football. In 99.9% of the cases, basketball is truly irrelevant in conference realignment, but Duke is that 0.1%. Even though few conference realignment stories would give me greater personal joy than seeing Duke getting relegated to the Southern Conference, it won’t be happening. Much like Virginia Tech with UVA, it’s a pretty easy “yes” decision for the Big Ten if the league has a chance with UNC with Duke being part of the package. Syracuse, Boston College – It’s not inconceivable that the Big Ten could go after either or both of these schools as part of a Northeastern-centric expansion, but Jim Delany seemed to emphasize expansion into the “Mid-Atlantic” (which would intimate more of focus on Virginia and North Carolina in the future) much more than the Northeast and New England per se. That makes sense since the Mid-Atlantic region is where the long-term demographic shifts are very favorable (not to mention much stronger football recruiting territories, whereas Upstate New York and New England are growing as slowly as the Midwest. I was someone that always like Syracuse as a Big Ten candidate since its basketball program could actually help get BTN subscribers in the NYC market as much as any other school and it might even make more sense to pair them up with Rutgers, but the feedback that I’ve always received from Big Ten circles was that the conference has been lukewarm on the Orange. Boston College has the presence in a major market, yet it might be even tougher for the Big Ten to crack that area than even NYC. New England doesn’t have the same critical mass of Big Ten alums that the New York/Jersey area has. That being said, I think the value of BC is often underrated by fans as to how much it is overrated by conference commissioners and university presidents (if that makes sense), so I wouldn’t ever discount them. Florida State, Clemson, NC State, Louisville – Pure athletics focused expansion candidates with good-to-great recruiting territories and markets, but the academics likely wouldn’t be good enough for the Big Ten. Personally, I’d take a hard look at Florida State because they are so extremely valuable in a key state (especially if the Big Ten is seriously considering Georgia Tech and don’t want them to be a lone outpost), yet the tea leaves are saying otherwise. Pitt – As I’ve stated in previous posts, it’s a great academic school with a solid athletic department, but it is one of the few schools out there that wouldn’t add any BTN revenue at all since Penn State already delivers that market. This is too bad since the Panthers fit into the Big Ten extremely well on almost all other levels. Wake Forest – I personally like Wake Forest at some levels, but it’s a small private school without the research capabilities of Duke or the market of BC. As for the Big East, the only school that would even have a chance at the Big Ten is UConn, and I’d put the odds of that merger occurring as extremely low. Connecticut is in a similar position as Syracuse and Boston College – Upstate New York and New England have large populations as of today just like the Midwest, but the demographic shifts favor the Big Ten waiting to get into Virginia and North Carolina. Also, I had previously stated how an ACC invite was UConn’s to lose and I stand by that with Louisville athletic director Tom Jurich saying, “UConn wasn’t penciled in [for the ACC]. It was penned in.” However, I underestimated how much the relative youth of UConn playing football at the FBS level could really affect perceptions of the school negatively. For better or for worse, the Big Ten wants to be able to show grainy footage of schools from the 1960s and 1970s on BTN and claim them as conference successes. (Those 5 Nebraska championship teams were among the greatest Big Ten squads of all-time!) I’m only half-joking there. The fact that Rutgers has a really long history of playing college football as the first school to participate in a game seems to trump the fact that such history hasn’t exactly been illustrious. The Big Ten is ultimately an old school league, and while UConn was at the Division I-AA level for many years prior to moving up to the top level in 2003, that history (whether fair or not) doesn’t seem to count with the power conferences. So, this is a really long post with a ton of interesting hypotheticals, but I don’t believe that the Big Ten itself will pull the trigger on any of them unless UVA and/or UNC is ready to bolt. My feeling is that those schools aren’t anywhere close to being ready to leave the ACC, so my money would be on the Big Ten waiting for awhile as other leagues decide about whether to react. I’ll be taking a look at the realistic options of those other conferences over the coming days.